Rent our Jaguar E Type in London. A beautiful classic car that everyone has the chance to experience at the low price we offer. Hire our E-type for just £350 per day. We will match your quotation if you find it cheaper. Love Classics specialise in luxury classic car rental. We are proud to present the legendary Jaguar E-Type. In 1961 at the Geneva motor show the E-type stunned the world. Some things never change. 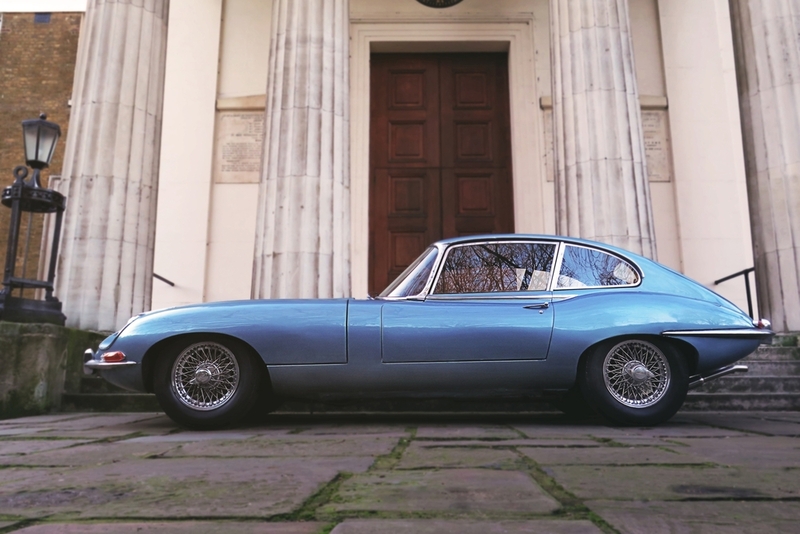 Designed by Malcolm Sayer, this 6-cylinder E-type is regarded as the world’s most beautiful sports car as stated by Enzo Ferrari himself. This sixties icon has that wow factor and is finished in the desirable opalescent blue with navy leather interior. If you speak to the Jaguar experts, they will tell you that this E-type engine is the one to drive - straight six, 4.2 litre double overhead cam, with the classic E-type appearance. Classic cars are a speciality for Love Classics, we are proud to have one of the most affordable classic car fleets to rent in the country. Hire the Jaguar E-Type Series 1 with Love Classics today and experience this legend for yourself! This bespoke designed Jaguar E-Type gift voucher is ideal for anniversaries, birthdays, weddings, father's day or even a Valentine's day present. If you're planning to buy a rental day as a gift for someone, then we will send you a personalised voucher to give to them on that special day. It also serves as a keep-sake so after their day out they will have something to remember their experience.